Do you have a Masonic Temple that is outwardly unremarkable, that thousands of cars drive past every day without knowing it's there? I learned this in film school: lighting is everything. So many lodges over the years have given up their former (and usually grander, or at least more distinctive) temple buildings, and moved into pole barns or other far simpler structures that, unfortunately, just seem to fade into the surrounding landscape. 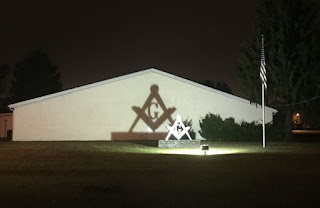 This lodge either deliberately or accidentally came up with a simple bit of yard art combined with a single light that makes this otherwise plain wall jump out and announce that the local Masons inside are alive and well. You sure can't miss it. It is noteworthy how such a simple procedure raises the profile of the Freemasons in the community a thousandfold. Thank you for bringing this to our attention. Check out our lodge, Berwind 141 in Berwind, West Virginia. It's an old bank and could use a little zazz. Any suggestions? I would, but you guys have no website or Facebook page that I can find, and a Google search for images also turned up nothing. I searched on Google Maps and here is the street view: https://www.google.com/maps/@37.267812,-81.6669848,3a,75y,72.34h,92.17t/data=!3m6!1e1!3m4!1s4dYoC52hzyGw1cRRdl85SA!2e0!7i3328!8i1664. Wow. I hate to say it, but it looks abandoned. At the very least, you guys need a new sign, lit at night, and closer to the road. The one you have looks like a rusty old gas station sign. And these days, any lodge that doesn't have a website is slitting its throat. Ask your trustees how a potential member is supposed to find your lodge. As our lodge webmaster, I'm surprised at the number of lodges in the area that don't have any updated web presence. It's frankly suicidal at this point. If a guy goes online looking for a lodge nearby to join, and sees either no website, or one with a 2004 list of officers, he'll move on. If you need to be depressed, the Grand Lodge of Georgia has posted pictures of all its lodges. So sad. in all their years, nobody has planted a shrub or tree to commemorate a brother, or thought how paint could make a huge difference. Sterility, the ultimate sullenness in architecture, reflecting the bankruptcy of Georgia masonry -- and repeated in other southern states. Rednecks and bigots revealed in bricks and mortar. Come on, Paul. Southern Masons don't have a corner on letting their temples look abandoned. Freemasons of a certain age have deep pockets and short arms, and they just aren't going to put up a dime to improve their facilities. How many times have I heard during a discussion proposing landscaping, repainting, adding lighting or signage that it's the "internal not the external qualifications..."
You are certainly right that, as you well put it. there has been an universal exodus from stately buildings to suburban sheds. In many cases. a smart businessman has then taken the building, restored its glories, and even ironically rented it back to us when we needed to put on something nice. But if you look at similar photo collections -- for example the Massachusetts Eastern Star has a great one because they meet in Masonic temples, -- the Georgia lodges win the competition for the abandoned unloved look. You are right however that in general the lodges everywhere are likely to be available for the next community haunted house fundraiser without needing any decorating. It reflects the general situation, which is of a community with exceptionthat has abandoned it heritage.